potential bicep tear in the future? Hey guys, been having some issues with my right arm for a while....not sure if it is due to my mixed grip on deadlifts (and I'm a fairly heavy deadlifter, pulling mid 400's for reps @ 209lb BW). My right hand has been my underhand all this time...not sure if that's what's caused this issue since my left arm has no issue. Anyways, symptoms...when I try and do the tricep stretch (WFS: http://www.makeoverfitness.com/image...-stretches.jpg), for my left arm, I can feel the stretch in the tricep. 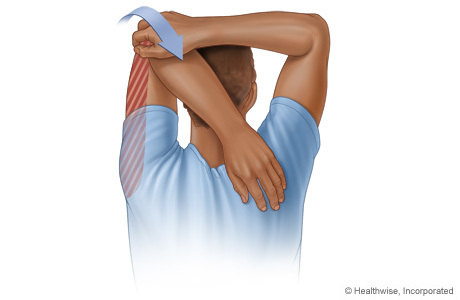 In the right arm, however, when I try and do it, I feel a sharp, almost-painful sensation that comes down through the bicep and into the shoulder joint/rotator cuff. Not sure what exactly it is, but let's just say I DO NOT feel the stretch anywhere in the right tricep, but rather pain just about everywhere else across the right bicep and rotator cuff/area where arms connect to the torso (sorry for layman words, not sure how else to describe it lol). One more symptom....this only happens on DB hammer curls and pullups, but on pullups if I let my elbows extend all the way down in between reps so my arms are completely straight and I'm hanging, I feel a pain in the right arm, specifically at the brachioradialis (however, if I stop at the bottom before my elbows are fully extended/arms straight and continue the rep back up, NO PAIN. the pain seems to happen when I try and use the full range of motion and I lose tension at the bottom of the pullup)....and EXACT same pain on hammer curls in the right arm at the brachioradialis when I try and use the full range of motion on the right arm by letting it extend all the way down on the hammer curl (so arm is completely straight but still in tension)....so common trend between the two is when arm is completely straight/extended in between reps of pullups/chinups and hammer curls, right brachioradialis (i looked up arm anatomy lol its this forearm muscle) hurts. HOWEVER, if I do DB preacher curls or anything with palms facing forward, NO PAIN. So, only on hammer and pullups/chinups. And left arm is always perfectly fine on both pullups/all curls. So, not sure if this is a right bicep issue that is also affecting the right forearm as well? any tips? anyone have any issues? Gonna switch my mixed grip from now on on deadlifts and use the left hand as underhand and right hand overhand. Edit: Also not sure if this was caused partially by the heavy pullup and curl volume I've done in the past 1-2 months....I went from 0 pullups and 0 curls in 3 years to doing 50 reps across multiple sets (10 sets of 5 reps) 2x a week (on both my bench and overhead press day on 5/3/1), same with doing hammer curls 5x10 twice a week (until the right brachioradialis started hurting/twitching during them so I switched to preacher curls). Not sure if the brachioradialis is also being stressed by the heavy farmer walks I've been doing every week for a while....I do them after heavy deadlifts, and been doing weights ranging from 205 in each hand to 255 in each hand for 5 sets that are 80-100 feet. Argh...no idea what's causing issues. However, I get no pain when doing farmer walks. Only on pullups and hammer curls. Maybe I should use a tennis ball to massage it. Who knows. Last edited by John Koshy : 02-13-2012 at 09:04 PM. Re: potential bicep tear in the future? Just tried massaging the area with my fingers...hurts like hell lol. Definitely did not have this pain when I first started curls/pullups, but I guess the 100 reps a week on each exercises might have been a bit overdone compared to the 0 amount I did the previous 2 years...so I guess I should take it down some? And keep massaging the forearms? I'm thinking its weak forearms (since I never did pullups before this and I remember them getting very sore when I first started) combined with overuse. Any ideas? Last edited by John Koshy : 02-13-2012 at 10:10 PM. Dude, get this checked out by an sports orthopedic doc or physical therapist who works with athletes. One of the big offenders with CF is kipping pullups, but if you've been overusing pulling/biceps for a while it can do that. I'm not a Crossfitter, sorry. On 5/3/1, competitive powerlifting lol. Sorry, the title of this thread is very misleading. My apologies.. When I slowly lower myself with tension on pullups, I don't have the issue. Could just be my wrist/forearms getting used to this new load, yea? Last edited by John Koshy : 02-14-2012 at 08:24 AM. Reason why pronated grip hurts less is because it recruits more of the brachialis more than the biceps. It seems when you're recruiting more biceps you get the deeper shoulder pain. Possibly consistent with SLAP from what you've stated with your symptoms and positions. From reading that, it doesn't appear to be SLAP?...I get no pain from pressing movements including the overhead press. Also realized I've been using some semi crap form...been focused on pulling myself using my arms on pullups, as opposed to pulling through the elbows/lats which would reduce a lot of stress on the forearm. I guess this title may be misleading... I need to stretch my forearms and resolve that first I think. Alright, if you say so. You know better than any of us I guess... not sure why you're posting on the message board where no one can take a look at you if you know you can fix your problem with forearm work. Radiating pain from the biceps into the shoulder is generally not something you want to be messing around with. Yeah, sounds good. I'll make an appointment with my university's health center ASAP. Also for anyone interested, today for the first time in my life, I tried soft tissue work using a tennis ball on the forearms (been foam rolling legs, back, etc. for over a year but never done the arms)...both left and right, keeping the ball pressed against a wall and sliding it down my forearms if that makes sense...anyways, VERY painful in the brachioradilias in the right arm compared to the left. Left still hurts but not much, right is much worse. I definitely think the sudden volume in pullups and farmer walks led to this...considering that I started both around the same time (last ~ October). Gonna be doing daily forearm massaging from now on....better late than never. And right now, from the tennis ball-ing I did 2 hours ago, the right brachioradialis hurts as I'm typing this lol. Definitely a ton of scar tissue there. They usually don't have orthos or PTs there.